The Hmong Batik Class is a full day introduction to art of hemp production, batik design and indigo dyeing. This gives a rare insight into the richness of Hmong culture while in a warm, friendly, family environment. Each student will create a wax resist, Hmong style design on hand loomed hemp or cotton. Due to time constraints it is not possible to complete the dye portion of the process (if you are staying in Sapa for a few days, this an be arranged). The natural hemp renders a beautiful finished piece. Classes take place in our Sapa workshop. Courses begin at around 10am (we are flexible) and usually last between 5 and six hours. The day includes information about Hmong symbology, the importance of textiles and history. The smell of hot wax is one familiar to every Hmong batik artist. They are masters at creating intricate patterns made from wax and a tjanting tool - a tool made of wood with a small metal receptacle at the end for holding the hot, melted wax and the nib through which the wax flows. Batik is used to decorate pleated skirts and other articles of dress. 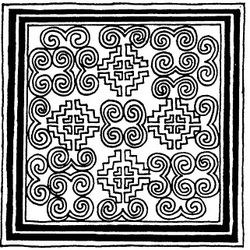 Not having had a written language, the Hmong created symbols from their surroundings and these symbols are used throughout their batiked cloth. Most Hmong cloth is hemp. The hemp is locally cultivated and is widely regarded as the crop of the future because it has such a low environmental impact. It can be grown and processed without any chemical treatments and yields three times more raw fibre as cotton. Once the cloth is covered with batik drawing and all the wax has dried, it is dyed in a natural indigo vat, dipped many times to achieve the dark blue colouring. Then the wax, which is a resist and therefore resists indigo from penetrating in the areas where the wax has been applied, is removed by boiling the cloth in water. In the arts of the Hmong we find many examples of the use of symbols. Symbols in most cultures can be traced to a time before a majority of people could read and write. Everything stood for something. If you had the “right dictionary" you could read the symbols. Colours were significant as well as the designs themselves. Batik designs contain traditional and highly symbolic patterns. For instance, the snail is a symbol of family growth and interrelatedness. The centre of the coil of the snail's shell symbolizes dead ancestors. The outer spirals are the successive generations, and the double snail shell represents the union of two families and also symbolizes the spinning motion used in many spiritual chants. Shapes of designs, expressions of nature, and spiritual depictions all have specific meaning. One caution, though, is that diversity is one of the most salient characteristics of the Hmong. For instance, different Hmong groups may have different interpretations for designs that are considered the "real" ones. The overall pattern of the symbols, however, is common to all Hmong groups. 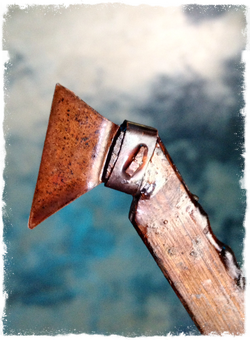 Tjanting Tools (also known as canting) are traditional pen-like tools used in batik for applying melted wax to fabric in order to draw pictures and patterns. Each tool is used to hold and apply hot wax to fabric by holding the wax in such a way that the artist can direct the pattern laid down by the wax. Most Hmong Batik artists use three different tools which are subtly different in design. Each is used for the application of wax in specific ways. Many see the tools themselves as artwork and sourcing excellent quality equipment can be a challenge.